Pinnacle’s Mission Ministry Group recently extended its mission outreach to include Create Academy, a two-year-old tuition-free public charter school serving low income families. Kelly Horn is Principal of the school and was formerly Director of Children’s Ministry at Pinnacle Presbyterian Church. 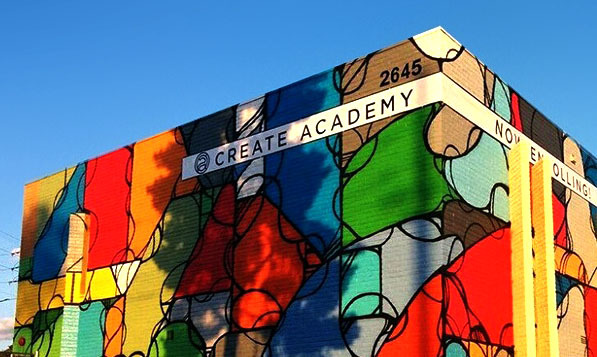 Create academy is a K-5 tuition free, public charter school with 137 students located in Phoenix off Highway 51 just east of Children’s Hospital. The school is dedicated to arts integration, project-based learning and social justice. Between 80-90% of the students are below the poverty level. Some students live at UMOM family homeless shelter. Through an arts integrated curriculum anchored in project -based learning, Create Academy aims to prepare all students for success in college, career and society by teaching students to collaboratively invent, design, and implement creative solutions that address society problems and injustices. Research shows arts integrated programs of study increase student achievement, decrease discipline problems, and increase student attendance across multiple schools and school districts. Another goal is to equip students with the basic academic and social skilled needed to succeed in a public middle school. Pinnacle members will have an opportunity to make a difference at Create Academy through volunteering at the school, financial assistance and prayer support for teachers and students. Please look for the Arizona Public Education Tax Credit envelopes in the pew racks beginning Sunday, April 22. Bring your donation envelope on Sunday, April 29 or drop off in the church office no later than Friday, May 13. We encourage you to support this important local mission project. Help us build an emotional and spiritual relationship with the children and staff members at Create Academy.